This is the first of a series of blog posts I hope to post throughout the summer describing my research experiences at my field site in Alaska. I’m going to try and post once a week throughout the field season (June-August) about my experiences and experiments. Stay tuned, and follow along on either this blog, or Twitter, or Google+. I flew up to Fairbanks, Alaska on June 2 to spend the field season (June-August) working on the field component of my postdoctoral researcher project. We (the “principle investigator” (PI), Dr. Rebecca Neumann and I) are studying methane oxidation in boreal forest bog and fen wetlands. I’ll start with some background information on what we’re studying and why, then I’ll talk a little bit about my experiences from this week. Methane is a potent greenhouse gas which is approximately 20 times more effective at trapping heat in the earth’s atmosphere than carbon dioxide. One of the major sources of methane is natural wetlands. Because wetlands in the boreal forest regions of the world are going through such rapid changes do to climate change, we’re focusing on these wetlands for our research. These wetlands are changing quickly due to the melting of permafrost – a layer of frozen water and soil below the surface that remains frozen throughout the year. As areas underlain by permafrost melt, the ecosystem changes from a black spruce forest (dark parts of the forest in the picture above) to a bog dominated by sphagnum moss and/or sedges (light colored parts of the forest where the trees are thinned out). 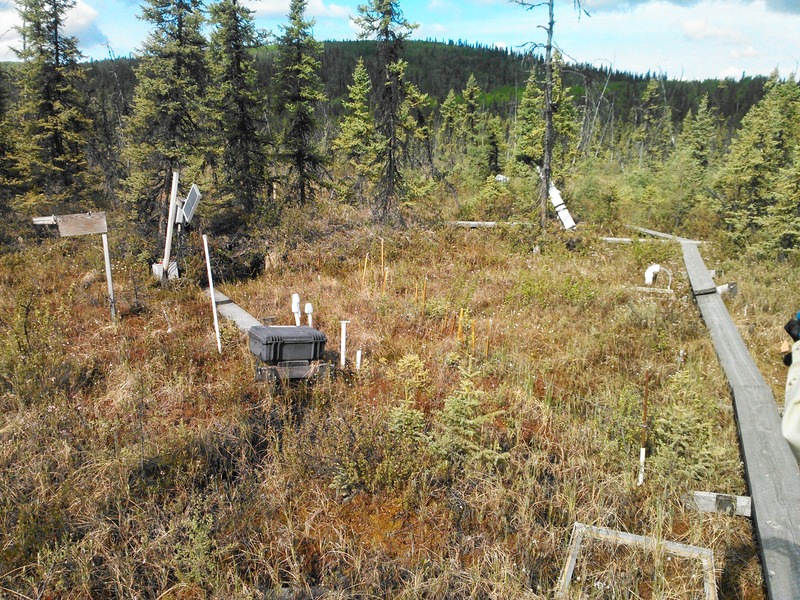 These bogs can be significant sources of methane, but the magnitude of methane flux (losses to the atmosphere) depends on a lot of factors – methane oxidation in particular. Methane oxidation is a process that’s mediated largely by aerobic bacteria which consume organic matter, methane, and oxygen, and release carbon dioxide. They depend on oxygen, and exist either near the soil surface, or in the volume of soil immediately surround plant roots called the rhizosphere. Because plant roots require oxygen, plants have developed methods to allow the diffusion of oxygen down into the soil. Some of this oxygen diffuses into the rhizosphere where it can be used by the microbes to “oxidize” the methane into carbon dioxide. Our goal is to figure out what factors control the amount of oxygen that is delivered to the rhizospheres of these wetland plants, and just how much methane is oxidized as a result. What we learn from these field studies will help Dr. Neumann, her grad students, and some collaborators refine climate change models so scientists can better predict if the warming of these wetlands (and melting of permafrost) will contribute to additional global warming. The picture above gives you a pretty cool view of what the boreal ecosystem looks like. The field site is the Bonanza Creek Long Term Ecological Research Station (LTER) which is about a half hour west of Fairbanks, Alaska. The wetlands are down in the floodplain of the Tanana River. It’s very flat in the floodplain, but there’s significant microtopography due to the permafrost. 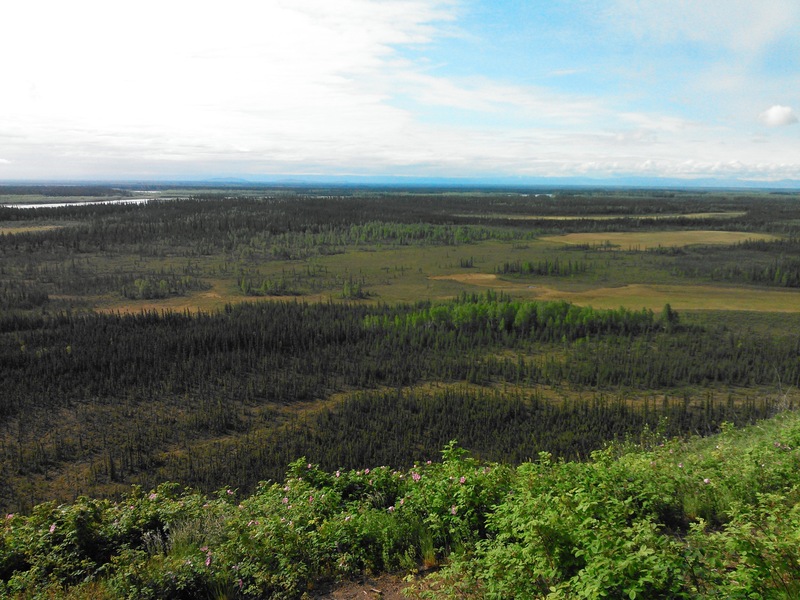 The hills and mountains around the Tanana are very large. You can get a sense for the topography of the area in the picture below. The annual average temperature in the area is right around 0 degrees Fahrenheit, but it can get well below -40 degrees in the winter, and above 80 degrees in the summer. The mosquitoes are pretty bad at the site, but nothing I’m not used to as a wetland soil scientist. There are bears and moose in the area, but there aren’t any poisonous snakes or spiders – which I could get used to after working in wetlands in North Carolina for the last five years (which also had bears but not moose). In addition, the ticks do not carry Lyme’s disease here either! Surprisingly, the black spruce trees in this area are very slow growing due to the extreme conditions in which they’re trying to survive. The tallest trees in the picture below (about 15 feet [5 m] tall) are over 300 years old! I spent the last week meeting some of our collaborators, touring the field site, testing some soil coring methods, and just prepping for the rest of the field season. Walking on the sphagnum moss can actually kill the moss, so there has been a network of boardwalks constructed in the site. I worked on improving some sections of boardwalks this week, and repairing some sections. We’ve had some delays in getting our supplies up here, including lost luggage, shipments that were rejected by Fedex, and more, but I think everything is moving now so hopefully we’ll be installing instruments in no time. Stay tuned for more pictures and stories from the field. This entry was posted in Alaska Wetland Methane Project, Colby's Research and tagged Alaska, Bonanza Creek, LTER, Research, soil science. Bookmark the permalink. ColbyDigsSoil by Colby J. Moorberg is licensed under a Creative Commons Attribution-NonCommercial-NoDerivs 3.0 Unported License.